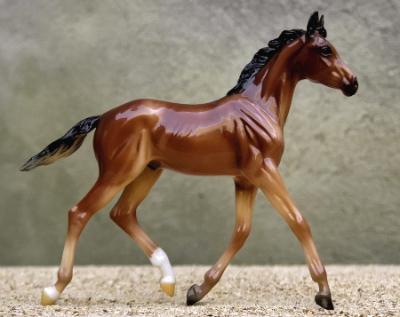 Please note that the naming rules for Warmbloods vary by breed. See the Breeding Rules page for detailed information on specific breeds. 1990 grey Hanoverian, Starlite Original “Hanoverian” o.f. Bred by Cory Hartung/Double Hart Ranch. He was gelded in 2003, so his last foal crop is 2004. Artistik is a powerful horse, with great balance and the conformation needed for a variety of performance events. Multi-Grand Champion, 2015 MEPSA Reserve Champion WB, Reserve Champion Other Resin, IMEHA Premier Champion - Halter/Headstudy, Champion - Endurance/Jumper/English Games, OFCC Silver Medallion. 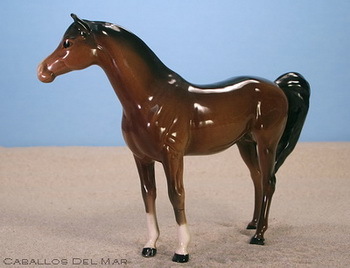 1993 chestnut Oldenburg stallion, Breyer SM G3 Standing TB OF. Full brother to the fine stallion Donnerschwee, Don Vito was imported from Germany as a two-year-old. IMEHA Supreme Champion, OFCC LOM. 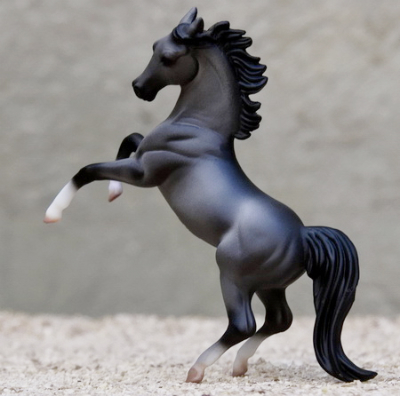 1993 black Dutch Warmblood stallion, Breyer Classic Totilas Resin OF. A son of the great Hanoverian stallion, Grannus, Limoges K was imported from Holland in 1995. 2015 MEPSA Champion WB and Champion Black (Mini), IMEHA Champion, OFCC LOM. 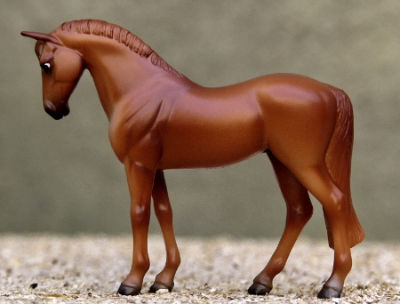 1993 chestnut Trakehner stallion, Breyer SM G2 WB OF. Beautifully bred by Double Hart Ranch, Satellit has a great model/real horse pedigree. IMEHA Paragon Champion, OFCC ROM. 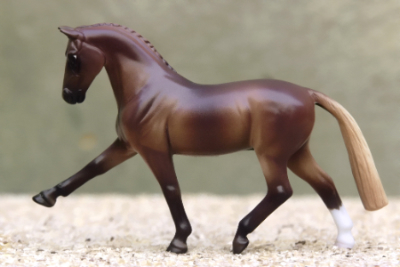 1994 chestnut Swedish Warmblood stallion, Breyer Salinero "Mistral Hojris" OF. Bred by Cory Hartung/Double Hart Ranch. 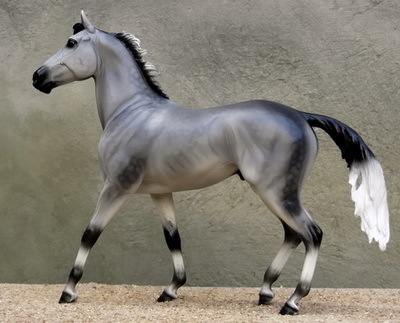 Beautiful color on this flashy stallion. OFCC ROM. 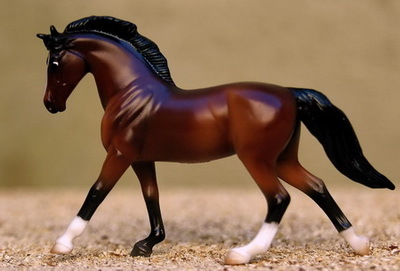 1994 bay Dutch Warmblood stallion, Breyer Idocus OF. Sired by the great Ramiro Z, Mendacino is on our showstring. IMEHA Superior Champion, OFCC LOM. 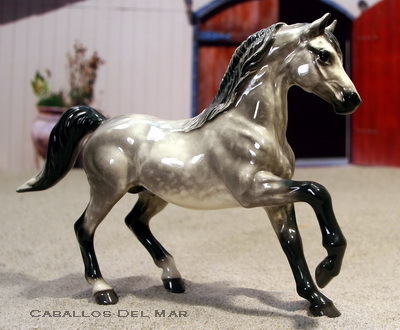 1995 grey Swedish Warmblood stallion, Breyer Silver Lining Resin OF. Imported from Sweden as a yearling, Escher was sired by the great show jumper, Opius, out of a daughter of the important sire Urbino. 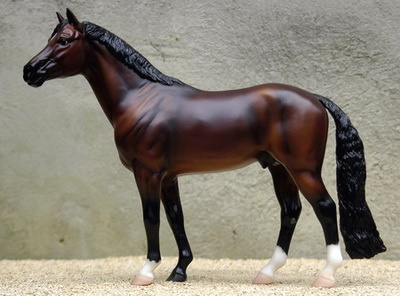 He is the lovely Breyer cold cast resin, IMEHA Champion, OFCC LOM. 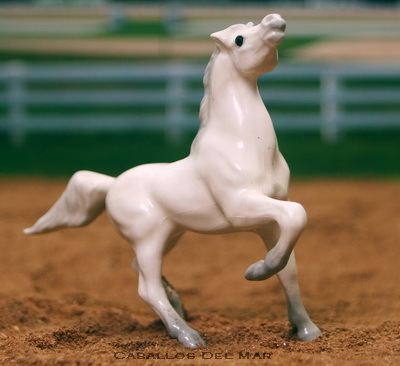 1995 grey (black) Trakehner stallion, Breyer Idocus "Snowman" OF. Bred from Indigo Creek's terrific program. Presto is currently unshown. 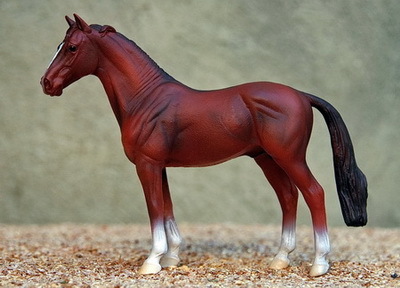 1996 red roan Trakehner stallion, Breyer SM G3 Standing TB OF. 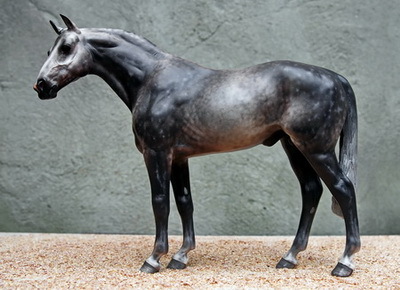 Aalen's sire was an international-caliber cross-country and eventing horse who had been just begun his dressage career when he died unexpectedly. Shown lightly, Champion. 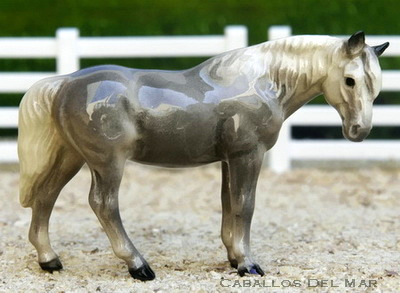 1996 grey Oldenburg, Breyer “Ideal” o.f. Bred by Cindi Nakagawa/Indigo Creek Stables, Fantasm combines the best of Oldenberg, Selle Francais and Angle-Arab breeding in his pedigree. Sire of our top show colt, Fan Boy. Multi-Reserve Grand Champion, IMEHA Supreme Champion - Halter, Champion - Endurance/Jumper/Barrels, OFCC Silver Medallion. 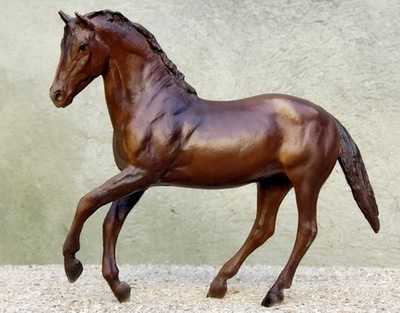 1997 chestnut Holsteiner stallion, Lakeshore Marshall OF. An anniversary gift from my husband (see also "Hitched", below), Consort has a great real-horse pedigree. 2013 MEPSA Reserve Champion China, IMEHA Superior Champion, OFCC Bronze Medallion. 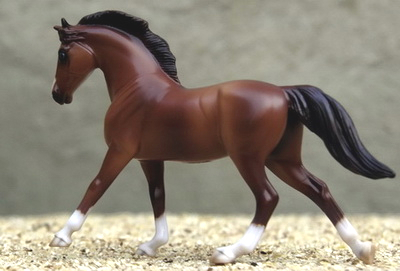 1997 chestnut Hanoverian, Breyer SM G4 “Dressage Horse” o.f. Another new face bred by Cindi Nakagawa/Indigo Creek Stables, For Love traces back to real horses through Towhee Wood Farm's excellent breeding program. IMEHA Superior Champion, OFCC ROM. 1998 grey (bay) Trakehner stallion, Lakeshore Marshall OF. The other half of my anniversary present from my husband (see "Consort", above), Hitched has already been in the showring and was NAN qualified when he arrived. 2013 MEPSA Champion China, Reserve Champion Grey and Reserve Grand Champion Manufacturer, IMEHA Superior Champion, OFCC LOM. 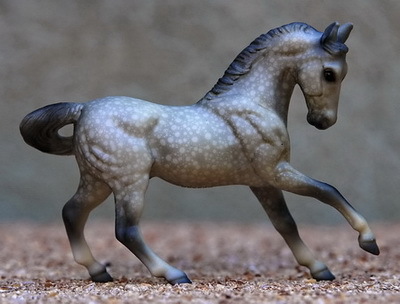 1998 grey Dutch Warmblood stallion, Breyer SM G2 WB Target SR OF. Great real horse pedigree, with both his sire and grandsire being dressage champions. IMEHA Premier Champion, OFCC ROM. 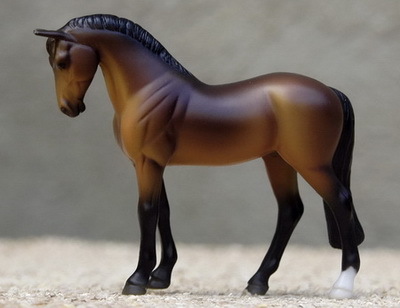 1999 bay Hanoverian stallion, Breyer SM G3 Standing TB OF. Sired by 2009 "Horse of the Year" and leading sire Escudo I, Estoque has achieved his IMEHA Premier Champion and OFCC ROM titles. Imported 2000. 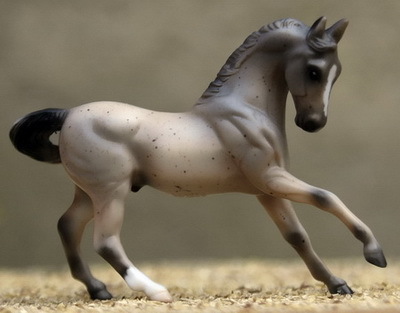 1999 dapple grey Hanoverian, Breyer “Hanoverian” o.f. 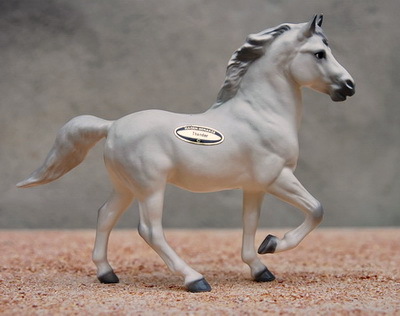 Warnish is from the 1986 Horses International special run of 200 dapple grey models. His sire, Weltmeyer, was 1998 Hanoverian sire of the Year and the 2003 USA Equestrian's Leading Dressage Sire. 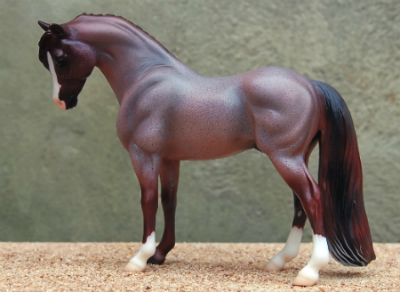 Grand Champion in TOPSA's huge Breyer Division, IMEHA Premier Champion, OFCC LOM. 2000 chestnut overo American Warmblood stallion, Lakeshore Marshall CMG. Gorgeous OOAK by Linda Watson Gresham, this handsome fellow was a birthday gift from my husband. He is by our chestnut Holsteiner stallion out of our grullo overo Paint mare. We hope to have him following in the hoofprints of his multi-Champion sire and dam soon! 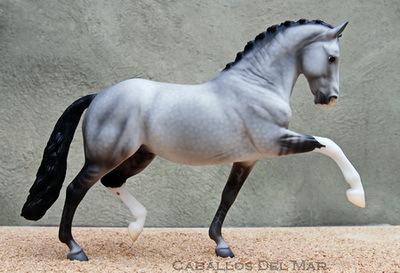 2000 dapple grey (born black) Belgian Warmblood stallion, Breyer Totilas "Fabien" SR OF. Great model-to-real pedigree from Double Hart Ranch. Unshown to date. 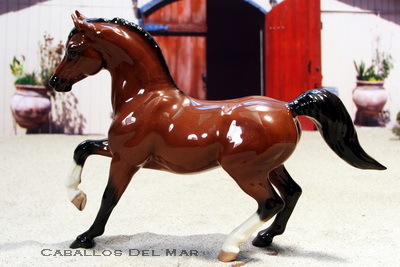 2000 chestnut Selle Francais stallion, Breyer #615 TB OF. Sired by international show jumping star and Olympic Gold Medalist Baloubet Du Rouet. IMEHA Champion, OFCC ROM. 2001 grey Holsteiner stallion, Breyer Showjumping WB "Cedric" OF. Bred by Cory Hartung/Double Hart Ranch, this guy was begging for an identity for over a year. OFCC ROM. 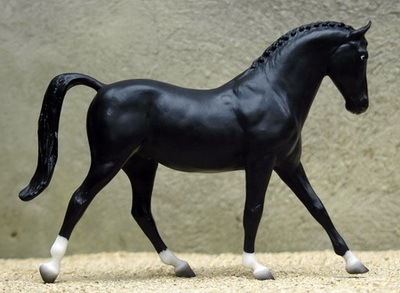 2007 black Dutch Warmblood stallion, Breyer Traditional Totilas OF. Chinatown's sire was the dressage champion of the KWPN stallion competition in 2001/2002. Imported in 2009, he has just started his show career, IMEHA Champion, OFCC LOM. 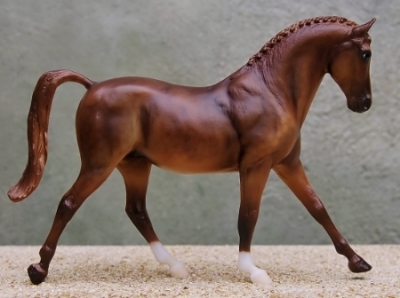 2009 chestnut Hanoverian stallion, CollectA Hanoverian OF. IPABRA 2015 Pedigree Auction - impeccably bred by Cindi Nakagawa/ICS. Unshown to date. 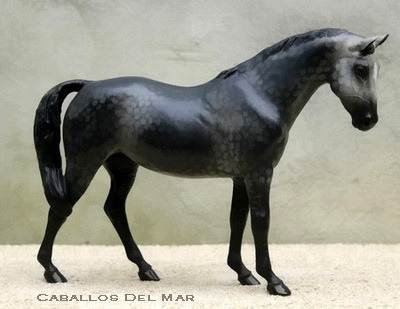 2004 grey (bay) Oldenburg stallion, Gerhardt Heart of Darkness resin CM by Karen Gerhardt. Absolutely gorgeous, amazing custom work by Karen. A son of two of our great showhorses. Unshown to date. 2010 bay Oldenburg stallion (shown as a foal), Breyer Heartbreaker OF. A full brother to Faraoh (above), Fan Boy has been exceptional in the show ring. 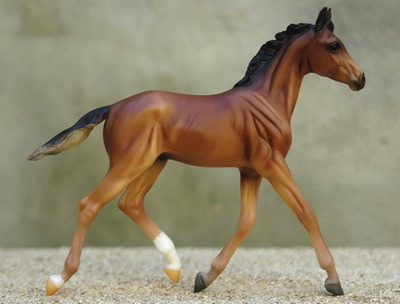 2010 bay Hanoverian stallion (shown as a foal), Breyer Heartbreaker OF glossy. Another homebred young stallion, multi-champion. 1994 bay Hanoverian mare, Breyer GG Valentine OF. Amazona is the lovely GG Valentine in glossy finish - beautiful model! Her sire was the 1994 Hanoverian Stallion of the Year. IMEHA Premier Champion, OFCC Bronze Medallion. 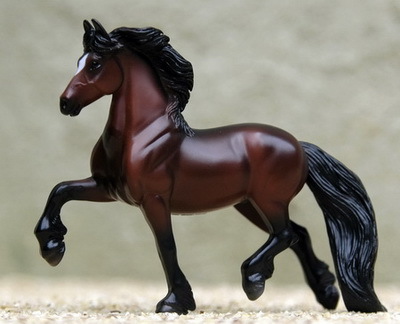 1994 black Trakehner mare, Breyer Classic Keen OF. With a model sire and dam, Karneval is bred by Double Hart Ranch and traces to real in the next generations. IMEHA Superior Champion, OFCC LOM. 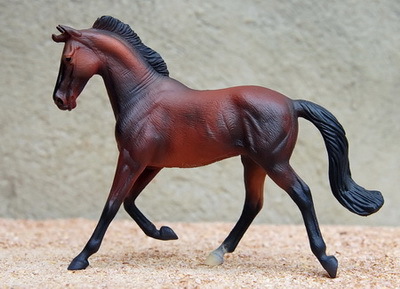 1994 bay Dutch Warmblood mare, Breyer SM G3 Cantering Warmblood OF. Sired by KWPN Horse of the Year Concorde, Melusina was foaled in the Netherlands and imported to the US as a three-year-old. IMEHA Premier Champion. 1995 bay roan Trakehner mare, Breyer SM G3 Cantering WB OF. Model parents from Double Hart Ranch, tracing to real in the next generation. Beautiful color, unshown to date. 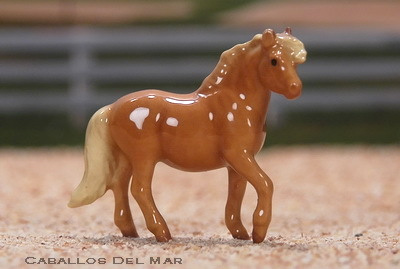 1995 chestnut Selle Francais mare, Breyer Classic Ginger OF. Another mare bred from our original stock, her sire is a world champion show jumper. OFCC ROM. 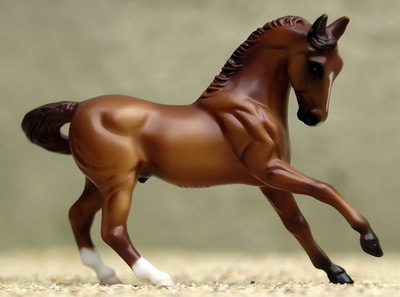 1995 chestnut Dutch Warmblood mare, Breyer SM G3 Cantering Warmblood OF. Imported from the Netherlands in the same shipment as her stablemate Melusina, Nalanda's sire is known for producing dressage and jumping prospects. IMEHA Superior Champion. 1996 rose grey Hanoverian, Starlite Original "Jumping Horse" o.f. Bred by Double Hart Ranch, Daccar's sire is owned by Me Dow Stable. Multi-Grand Champion, multi-Champion, 2013 MEPSA Reserve Champion WB, 2012 IPABRA Top Ten Sport Breed, IMEHA Supreme Champion - Jumper, Premier Champion - Halter, Superior Champion - Hunter/Headstudy, Champion - X Country, OFCC Gold Medallion. 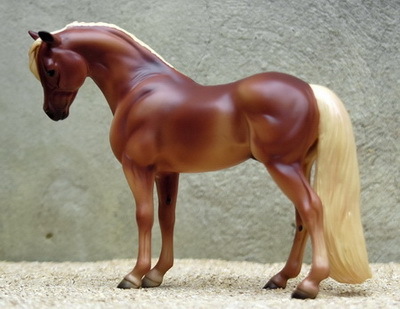 1996 bay Oldenburg, Breyer "GG Valentine" o.f. 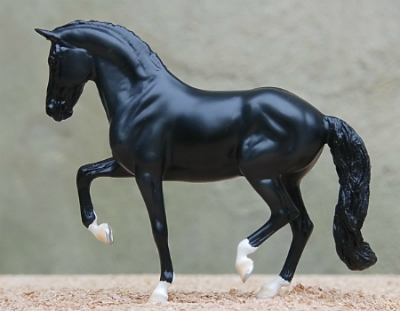 Bred by Green Mountain Stables, with a great combination of real and model bloodlines. Dam of our adorable Fantasm colt, Fan Boy. Shown lightly, 2012 IPABRA Top Ten Sport Breed, IMEHA Supreme Champion, OFCC Bronze Medallion. 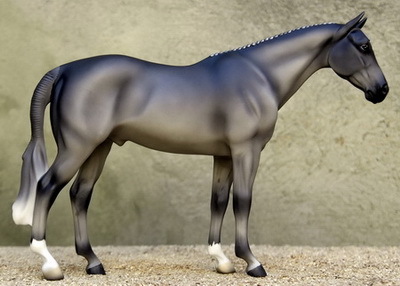 1997 grey American Warmblood, Breyer “Hanoverian” CM standing, head turned by CDM. 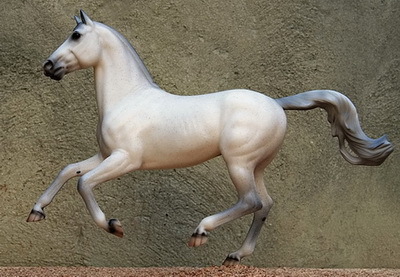 Lady combines the bloodlines of some of our favorite 1980s showhorses: Avalon, our MGC TB stallion; Dancerinthedark, GC at Western Regional Congress in her only show; and Castlesintheair, our MGC Percheron stallion. She is a big mare, with the speed and agility of her TB sire and grand-dam, and the solid frame and stamina of her draft grand-sire - she'll be a great cross with many warmblood/sporthorse stallions. Multi-Grand Champ, 2012 IPABRA Top Ten Sport Breed, IMEHA Superior Champion, Superior Event Award - Halter. 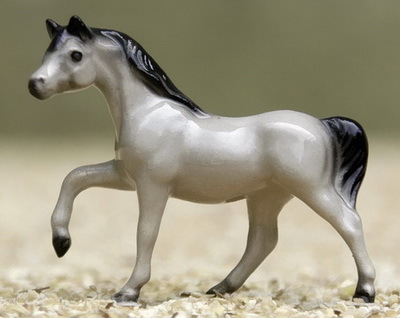 1998 dapple grey Holsteiner mare, Breyer SM G2 WB OF. Pedigree from Randa Garrett/Twin Springs Stables with two generations of model-breds leading to real. Unshown. 1999 chestnut roan Trakehner mare, Breyer SM G3 Cantering WB OF. 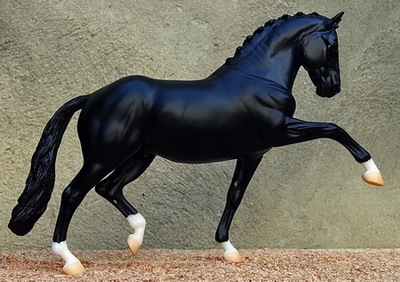 Beautifully bred by Jean Sorensen/Lake Hill Ranch - model to real horses. 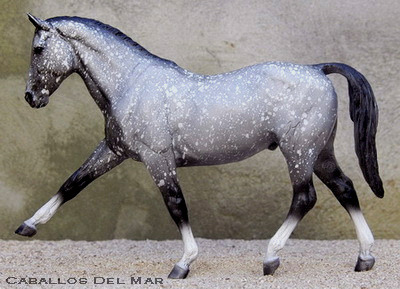 Rare color is bred from real known roan lines. IMEHA Champion. 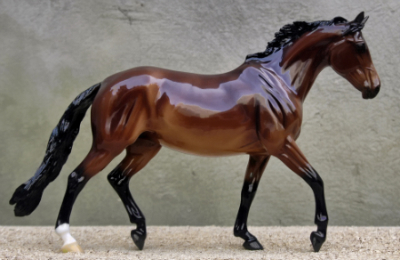 1999 dark bay Oldenburg mare, Breyer SM G4 Dressage Horse OF. Sired by the gorgeous elite dressage horse, Sandro Hit, this pretty lady hopes to be following in her father's footsteps shortly. IMEHA Superior Champion. 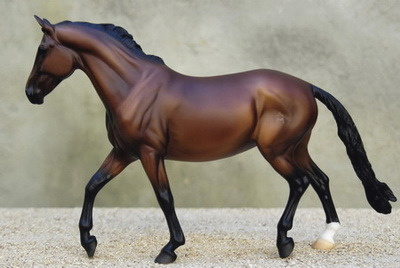 2001 silver bay American Warmblood mare, Breyer SM G3 Cantering WB 2007 JCP SR OF. Sired by a Swedish WB stallion and out of a QH mare. Beautiful color. Multi-Champion, IMEHA Premier Champion, OFCC LOM. 2003 black Selle Francais mare, BSO. Pendentif's pedigree has some of the great SF names in it - her sire is a World Champion showjumper in France. 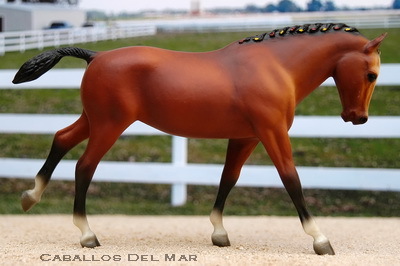 2006 bay Holsteiner mare, CollectA TB Mare OF. 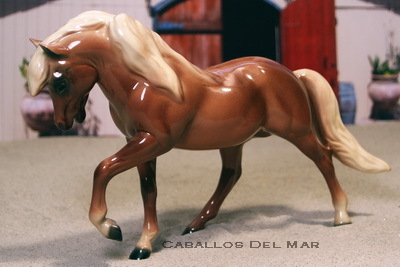 Bred by Caballos Del Mar/Twin Springs Stables, she has a lovely model to real horse pedigree. Unshown to date. 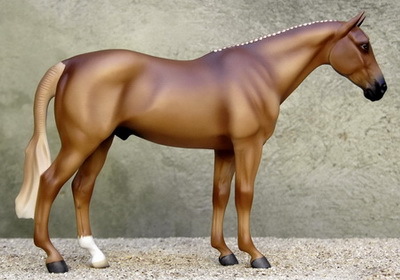 2007 liver chestnut Swedish Warmblood mare, Breyer Strapless OF. Divine takes the place of her lovely dam on our list. IMEHA Supreme Champion, OFCC Gold Medallion. 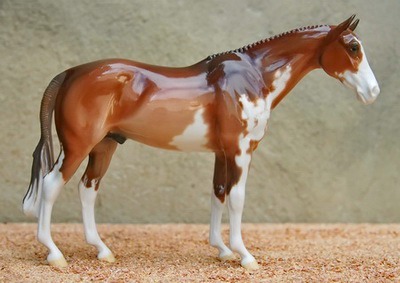 2008 chestnut Hanoverian mare, HR Mini Swaps OF. Reserve Champion, OFCC LOM (as Pagoda). 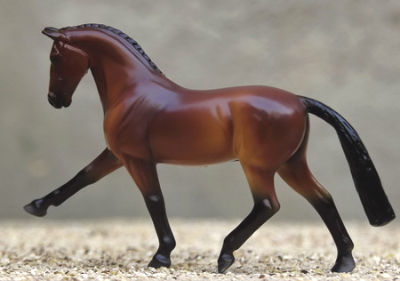 2008 chestnut Trakehner mare, Breyer SM G4 WEG Dressage Horse OF. Sired by Me-Dow Stables grey stallion, Haikai takes her dam's place on our list. Multi-Grand Champion, OFCC Bronze Medallion (as Haiku). Welsh ponies have always been a favorite of mine - I bred two real half-Welsh ponies in the 1980's - and our model herd has grown and grown. We currently have Section A, B, and C ponies available as well as Welsh Cobs. We use two prefixes for our Welsh: "Brecon" for our Section A/B's and "Glyn Du" ("Black Valley") for our Section C's and Cobs. While it is not required that you use our prefixes, it is always appreciated. 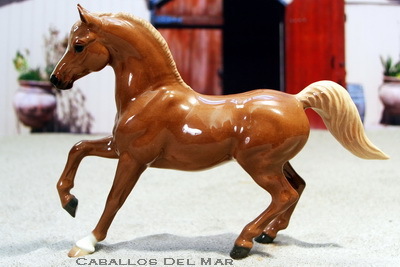 1991 chestnut Welsh Pony (Section A), HR Mini “Shetland Pony Stallion” o.f. glossy. We were thrilled to have the opportunity to bring Pepper to the states and add the bloodlines of the Springbourne breeding program to ours. 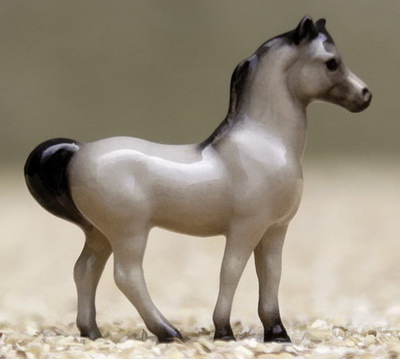 Pepper is small but he stamps a lot of style and personality on his foals. Shown lightly, Champion. 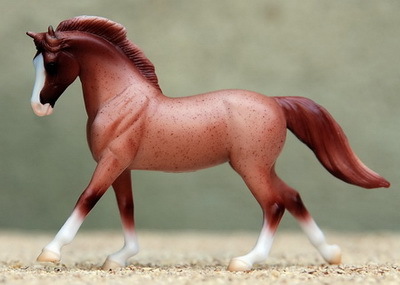 1993 chestnut Welsh Pony (Section A), HR Mini Mini“ Arabian Stallion” o.f. glossy. 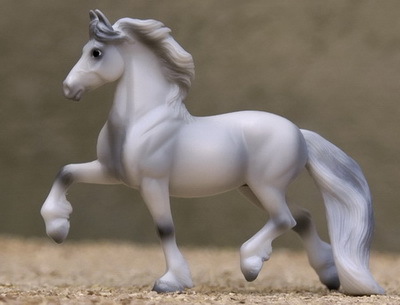 Ares is our smallest Welsh stallion, but very refined. His pedigree reads like a "Who's Who" of the great Farnley breeding program. Shown lightly - OFCC ROM. 1994 grey Welsh Sec A stallion, Breyer SM G2 Rearing Arabian OF. Imported from Wales as a two-year-old, Honor is from the famous Revel Stud. Terrific line-bred pedigree from one of the great Welsh breeding programs. IMEHA Superior Champion, OFCC ROM. 2001 grey (chestnut) Welsh Sec A stallion, HR Thunder OF. Marvelous Monrovia piece with name sticker. Sired by the 1999 US National Champion Section A Stallion, Dionysus is out of our lovely Section A mare, Brecon Lavender (see below). He has Springbourne Caraway on both the top and bottom of his pedigree - nine times winner of the WPCS Sire Ratings. Unshown to date. 2002 grey Welsh Sec A stallion, HR Head-Up Pony OF. Touchstone was bred by Dragon Star Farms, and takes the place of his sire on our list. Reserve Champion, IMEHA Superior Champion, OFCC LOM (as Blue Sky's Jester). 2003 grey (born black) Welsh Sec A stallion, HR Mini Mini Arabian Stallion OF. Wonderful real horse pedigree with Champion parents from the tremendous Severn and Liseter breeding programs. Multi-Champion in limited showing, OFCC ROM. 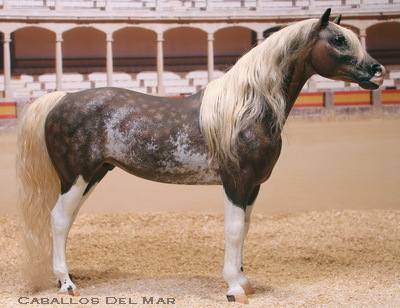 1993 bay Welsh Pony (Section B), HR Mini “Arabian Stallion” o.f. glossy. Peter is a great addition to our herd, a terrific outcross for our homebred mares. Multi-Champion, IMEHA Superior Champion, OFCC LOM. 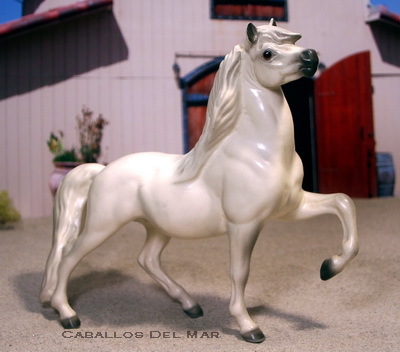 1995 bay Welsh Pony (Section B), Beswick “Xayal” o.f. glossy. A son of our original herd sire, Hermes brings excellent model and real Welsh bloodlines. Unshown. 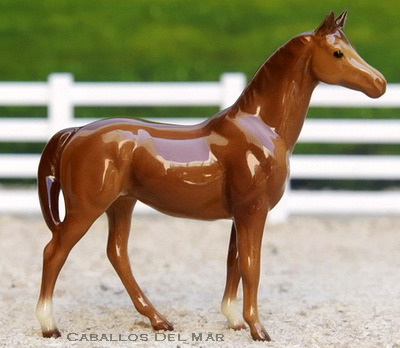 1999 chestnut sabino Welsh Pony (Section B), Breyer “POA” repainted/haired by Sarah Minkiewicz and Laurie Jensen. 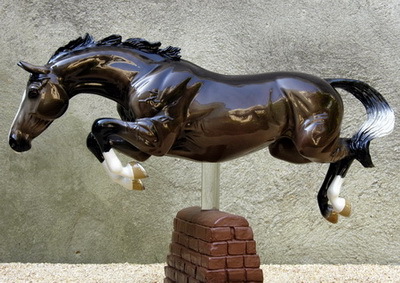 Sarah and Laurie are amazing artists – and when they collaborate on a horse it is really something! Multi Grand/Res Grand Champion, 2012 MEPSA Reserve Champion British Pony, 2012 IPABRA Top Ten Pony, IMEHA Supreme Champion - Halter, Champion - Headstudy, Superior Event Award - Halter, Register of Merit. 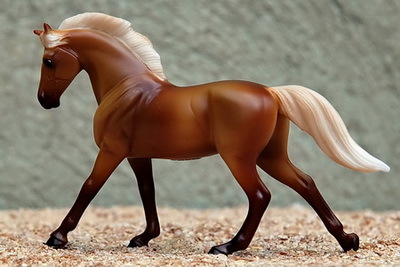 2001 chestnut roan Welsh (Section B) stallion, Breyer Pink Magnum OF. Sired by the real Pink Magnum, Top Shelf's dam is from Heather May's Green Mountain Stables, and has a lovely model-bred pedigree with ponies from October Moon, Cool Creek and Double Hart. Shown lightly, IMEHA Champion, OFCC ROM. 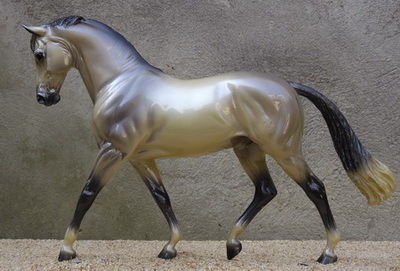 2004 dapple grey Welsh Pony (Section B), Hagen Renaker ”Encore” o.f. glossy. Sired by our Section B stud, Brecon Apollo, Poseidon has terrific action and color. Shown lightly, IMEHA Superior Champion, OFCC ROM. 2008 grey (chestnut sabino) Welsh Sec B stallion (shown as a foal), HR Scamper OF. The first son of two of our favorite show ponies, Hyperion has excelled in the showring on his own. IMEHA Supreme Champion, OFCC Silver Medallion winner. 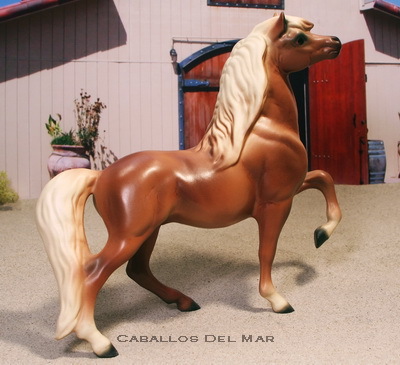 1991 bay Welsh Pony of Cob Type (Section C), BFA "Welsh Mountain Pony” o.f. Our first BFA, he's a real cutie with a marvelous real horse pedigree. Shown lightly, Grand Champion, IMEHA Superior Champion, OFCC LOM. 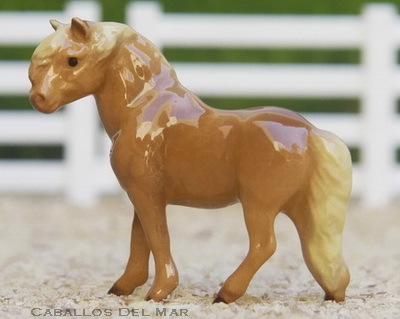 1991 chestnut Welsh Pony of Cob Type (Section C), HR DW ”Head Up Pony” o.f. One of our two Section C stallion imports, Madyn is a great outcross for our mares. Multi-Champion, IMEHA Superior Champion, OFCC ROM. 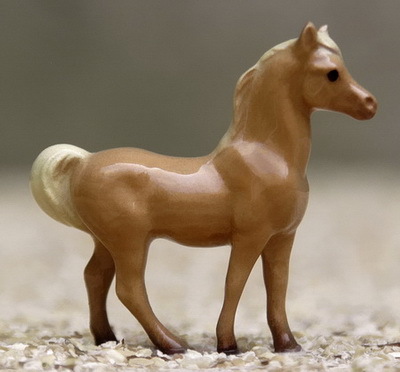 1994 chestnut Welsh Pony of Cob Type (Section C) stallion, Breyer Apple Jack OF. Imported as a yearling, Dony has a pedigree full of ponies from the great breeding programs in Wales. IMEHA Superior Champion, OFCC ROM. 2000 buckskin Welsh Pony of Cob Type (Section C), HR DW ”Thunder” o.f. glossy. Bred by Cory Hartung of Double Hart Ranch, Pirate takes the place of his sire on our list. Champion, IMEHA Superior Champion, OFCC LOM (as Colwyn Penadur). 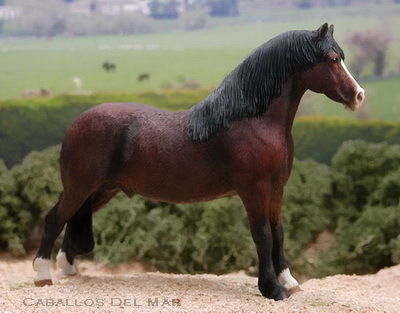 2001 dark bay Welsh Pony of Cob Type (Section C), Breyer ”Cefnoakpark Bouncer” o.f. Sired by October Moon Acres' Section B stud, Brenin is the first foal out of our Section C mare, Cyffaith. Multi-Champion, 2011 IPABRA Top Ten Pony, 2012 MEPSA Champion Pony Type Stallion, IMEHA Paragon Champion, OFCC Bronze Medallion. 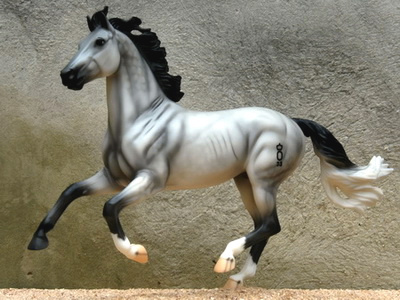 1993 grey Welsh Cob stallion, Breyer SM G3 Friesian OF. Traditionally, grey has not been the favored color of Welsh Cobs, but there are a few breeding programs where grey is happily introduced. Trystan comes to us from one of those and we are pleased to offer him at CDM. IMEHA Supreme Champion, OFCC ROM. 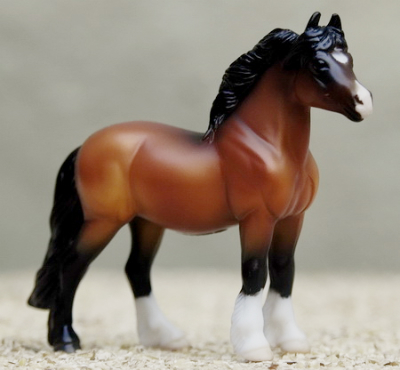 1993 bay Welsh Cob stallion, Breyer SM G3 Highland Pony Target SR OF. Beautiful color and conformation. Imported from Wales in 1995, IMEHA Supreme Champion, OFCC LOM. 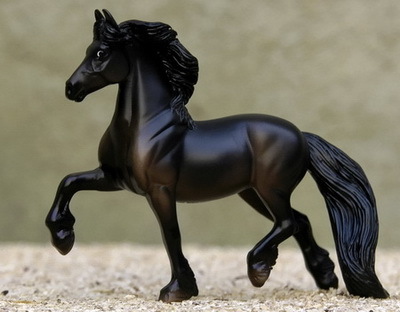 1998 black Welsh Cob stallion, Breyer SM G3 Friesian OF. Imported from Wales as a two-year-old, Emhyr brings some of the best Cob bloodlines to our herd. 2013 MEPSA Champion Black, Reserve Champion Other Pure Breed (Mini), IMEHA Supreme Champion, OFCC LOM. 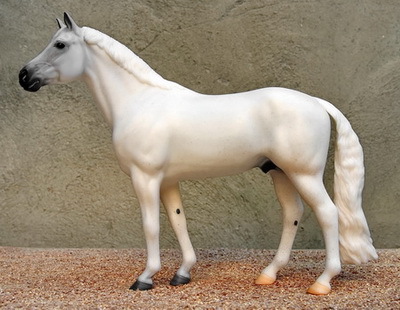 1995 grey Welsh Pony (Section A), HR DW “Heather” o.f. 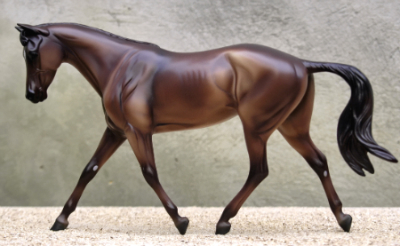 We just love this pretty little Section A mare. Dam of our cute Apollo colt, Brecon Hyperion (see above). Multi-Grand/Res Grand Champion, 2013 MEPSA Champion Pony Type Mare, IMEHA Supreme Champion, Superior Event Award - Halter, OFCC Silver Medallion. 2004 chestnut Welsh Sec A mare, HR Mini Shetland Mare OF. Half sister to our lovely sabino stallion, Brecon Apollo, Ruby takes the place of her dam on our list. Shown lightly, OFCC ROM (as Brecon Diamond). 2008 grey (palomino sabino) Welsh Sec A mare, HR Mini Postage Stamp Arabian OF. This lovely girl takes her dam's place on our list. Grand Champion, OFCC ROM (as Brecon Eclipse). 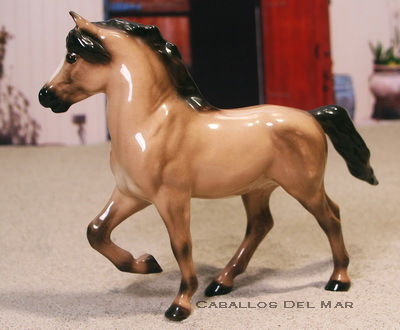 1995 red bay Welsh Pony (Section B), Breyer “Cantering Welsh Pony” o.f. 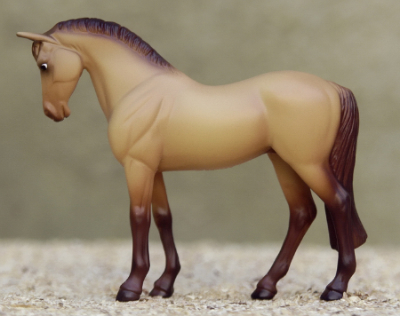 Violet is one of only ten red bay CWPs created by Breyer as a special run for the Regional Model Horse Congresses in 1987. Multi-Grand Champion, 2015 MEPSA Reserve Champion SR Breyer, IMEHA Paragon Champion, OFCC Silver Medallion. 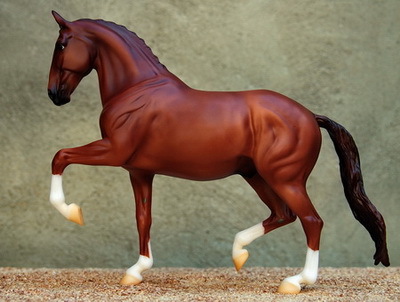 1996 chestnut Welsh Pony (Section B), HR DW “Encore” o.f. glossy. Cassandra's pedigree is a study of classic Welsh bloodlines, including both Criban Grand Master and Criban Victor. She is a very pretty mare with a lot of front end action. IMEHA Superior Champion, OFCC ROM. 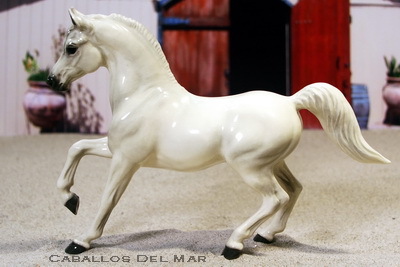 2001 palomino Welsh Sec B mare, Breyer "My Girl" CWP 2016 Vintage Club OF glossy. 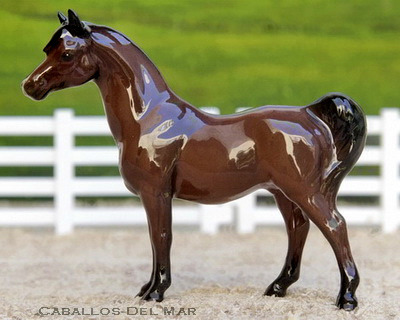 Bred by Caballos Del Mar/Persimmon Hill Farm, this pretty girl has a great model to real pedigree. Unshown to date. 2002 grey (bay base) Welsh Section B mare, HR Mini Mini Arabian Mare OF. Azalea is by our terrific stallion Apollo, and takes her dam's place on the list. Shown lightly - OFCC ROM (as Brecon Jasmine). 2005 bay Welsh (Section B) mare, HR Encore OF. This pretty girl takes the place of her dam on our list and combines some of our old Welsh lines with those of our stallion, Peter Pan. IMEHA Superior Champion, OFCC ROM (as Brecon Iris). 2008 grey (chestnut) Welsh Section B mare, HR Encore OF. 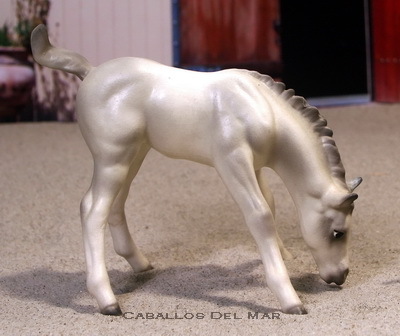 Bred by Caballos Del Mar/Green Mountain Stables, Perdita takes her dam's place on our list. IMEHA Superior Champion, OFCC LOM (as Brecon Ophelia). 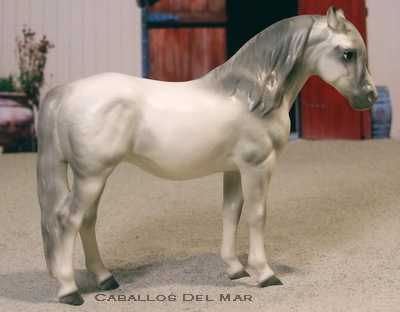 1994 grey Welsh Pony of Cob Type (Section C), HR Mini Specialty “Morgan Mare” o.f. glossy. Flirt comes from a long line of Section A ponies bred by Kelly Acres. 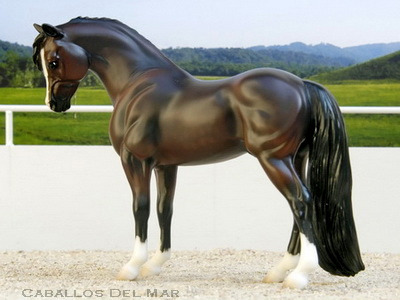 Her sire is the impressive Canadian-bred Cob stallion Brynarian Eiddwen Comet. Multi-champion, IMEHA Superior Champion, OFCC ROM. 1997 chestnut Welsh Pony of Cob Type (Section C), HR DW “Head Down Pony” o.f. Toffee's pedigree is a wonderful blend of two of the great Welsh stud farms - Synod on the top and Menai on the bottom - with some of the great names of the breed in between like Llanarth True Briton and Coed Coch Madog. Multi-Champion, IMEHA Premier Champion, OFCC Bronze Medallion. 2005 chestnut Welsh Sec C mare, HR Head-Down Pony OF. Taking the place of her dam on thelist, Jessica is sired by our Section B stallion, Apollo. IMEHA Superior Champion, OFCC LOM (as Glyn Du Jewel). 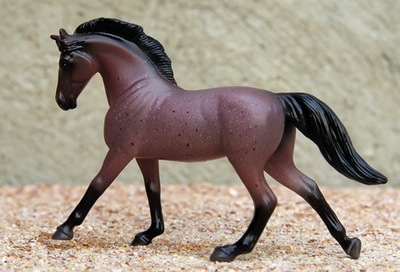 1991 black roan Welsh Cob mare, Breyer SM G3 Highland Pony OF. Imported from Wales as a two-year-old, Bewitched was our first Cob mare. Great names in her real horse pedigree. IMEHA Champion. 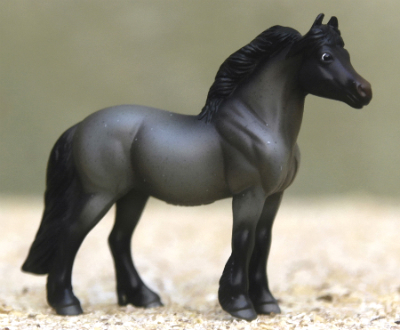 1994 bay Welsh Cob mare, Breyer SM G3 Friesian OF. A lovely mare with a great pedigree. 2015 MEPSA Reserve Champion Bay (Mini), IMEHA Supreme Champion, OFCC LOM. 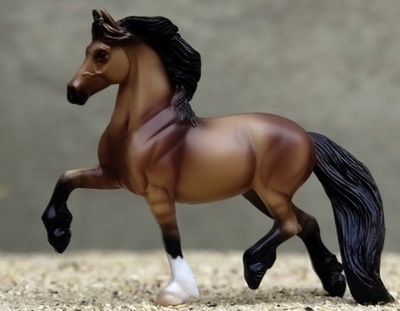 1999 buckskin Welsh Cob mare, Breyer SM G3 Friesian OF. 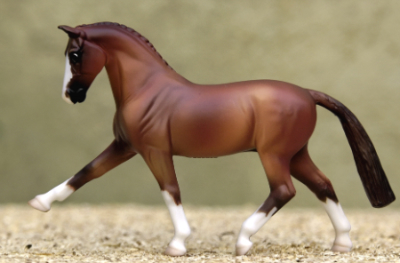 Flirtatious comes from a line of dark, dappled buckskin Welsh Cobs and she has counter-shading on her legs. Note that these are not "dun" markings - she carries the cream gene, not dun. Imported from Wales as a two-year-old. IMEHA Supreme Champion, OFCC ROM.